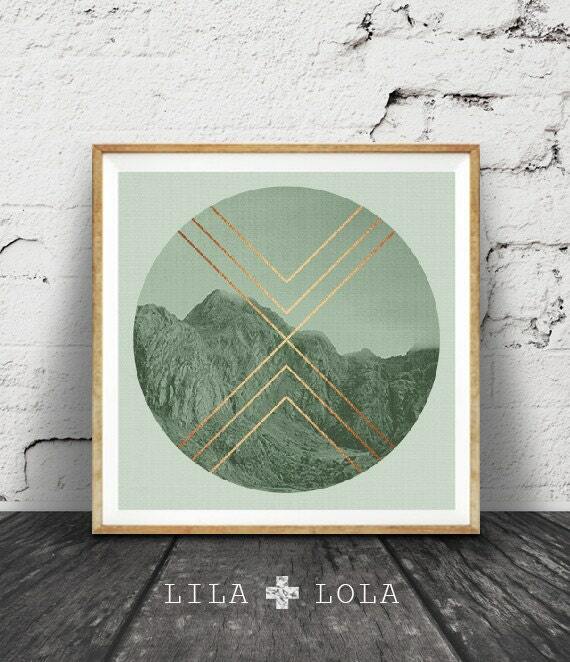 Print 13 - Geometric mountains print, sage green decor, faux rose gold copper foil, mountain photo, moody photography, Scandinavian wall art, square art. A contemporary instant digital download, printable in an array of sizes. After payment you will receive a link to download your file instantly. You will receive one JPG file, easily resizable to suit your exact requirements. The file is sizeable up to 20" x 20" / 50 x 50 cm. Your file will be accessible instantly and at any other time, by viewing your Etsy purchase page. Choose your printing method... Print instantly at home, take the file to your local printer or photo printing shop such as Officeworks, or upload online to a printing service such as Snapfish (where you can choose a photographic print or print it onto canvas or on a range of great products and have it delivered to your door!). Our prints fit a large range of standard frame sizes. We are always adding new designs to our print range, so favourite our shop and follow us to keep up to date! Please note that this is a digital download only, no physical product will be shipped and the frame is not included. Colours may vary slightly due to different colour monitors. The images used in Lila+Lola artwork is of our own creation or acquired from other artists and photographers with permission or purchase of an extended licence. Lovely design and good description. Merci!